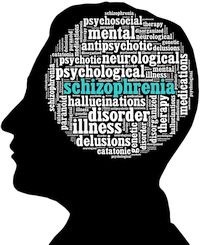 Schizophrenia is a disorder of thought and affects 1% of the world’s population. Someone with schizophrenia may have difficulty distinguishing between what is real and what is imaginary. The causes of schizophrenia are unknown. Patients with schizophrenia have a chemical imbalance of dopamine and serotonin, which are very important neurotransmitters in the brain. There may be a genetic or familial inheritance of the disease, as this disease may be seen in several members of the same family and across generations. However, there are also theories that viral infections and environmental triggers may also play a role. Symptoms usually appear between the ages of 13-25 and more often affect males. If you suspect that you or a loved one may be schizophrenic, the best first step is to seek a psychological/medical evaluation. Any expression (either verbal or physical) of violence towards self or another person should prompt immediate medical attention in an Emergency Room. In these cases, it is best to call 911.